Dicky Beach Family Meats or more affectionately known as db meats is a family owned and operated butcher shop, situated in the lovely Sunshine Coast Region in Caloundra. Proprietors Ivan and Debbie Conneely, with daughter Kate, have serviced the Gatton and Brisbane areas since June 2006, and now have taken up the reigns at Dicky Beach since July 2014. With over 40 years experience in the meat industry, Ivan and Kate can help you with all your meat needs. db meats specialises as a gourmet butcher providing various cuts of meat from beef, pork, lamb and chicken. Our bacon and hams are smoked in-house, and we make a variety of gourmet sausages. Check out our Products page for the full range of what we sell. db meats is a member of the Australian Meat Industry Council (AMIC), "the Peak Council that represents retailers, processors, exporters and smallgoods manufacturers in the post-farm-gate meat industry". db meats supplies only Australian Pork. Taste the difference and enjoy the quality. 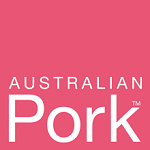 Fresh pork that is 100% Australian, tender, juicy and tasty. db meats supplies MSA Graded Beef. The MSA grading takes the 'guess work' out of determining whether your beef is tough or tender, and the MSA trademark is intended to assure quality eating for meals prepared using various cooking methods. db meats supplies Lilydale Chickens. Lilaydale chickens - superb quality Australian poultry. db meats supplies Australian Lamb. Our lamb is premium quality Fresh Australian Range Fed Lamb. 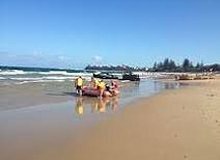 Dicky Beach, a suburb of the Sunshine Coast, Queensland is located within the Caloundra urban centre. 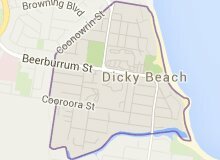 Dicky Beach was named after the iron steamboat, the SS Dicky, which ran aground during heavy seas in 1893.